Connections Catering specialises in home style cooking, perfect for any occasion. 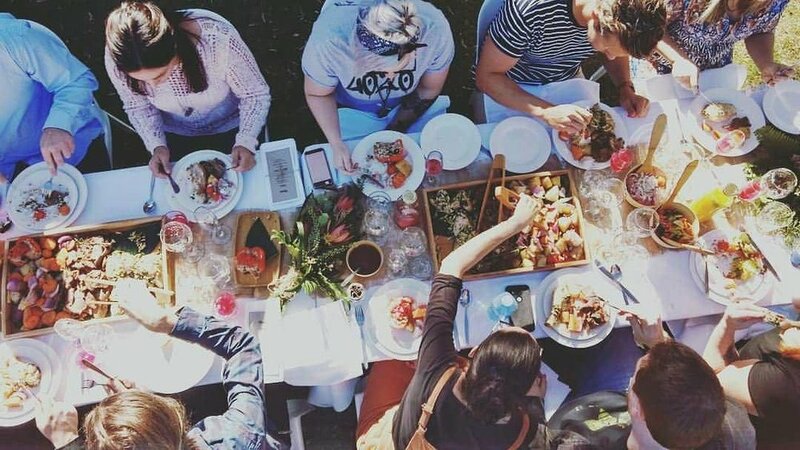 If you are looking for wedding, hens & bucks, corporate & office, birthday parties or just any reason to celebrate, Connections Catering covers all of Brisbane for any catering need. Brisbane Catering Services. Catering Brisbane, Sunshine/Gold Coast & Northern NSW for Weddings. Connections Catering has been servicing catering needs across Brisbane since 2007. With a belief in friends, family and even strangers connecting over a meal, Connections Catering uses quality locally sourced ingredients to prepare delicious wholesome food. From weddings, corporate, private parties and everything in between, Connections Catering provides flexible and professional service in all aspects of catering your Brisbane event. Local produce, handmade with love. At Connections Catering we work with you every step of the way to create the perfect menu for your perfect day. Be it from our no fuss set menus or working to create a customised menu tailored to you, Connections Catering understands the need to get every detail just right. Gather your loved ones and tell your story. Providing quality made to order catering, Connections Catering is here to make your next corporate event a breeze. Whether its a board meeting, conference, training session or an office celebration, Connections Catering can provide any catering needs from individually packed lunch boxes, hot finger food & sandwich platters through to full service catering. Connect over delicious handmade hot finger food, share platters or sit down plated meals. Connections Catering can provide catering for any type of celebration from birthdays, hens & bucks, cocktail parties or just any reason to celebrate. Whether you are after ready to serve delivery or fully staffed catering event, Connections Catering can cater to your every need. Here at Connections Catering believe in a meaningful food experience whilst catering all types of functions from corporate to weddings all across Brisbane. From our catering beginnings in 2007, connections catering has been devoted to creating a company that provides our customers with a meaningful food experience. We believe friend, family and even strangers connect over a meal. The act of sharing food with others is a time honoured tradition all over the world, and is a demonstration of the wonderful everyday moments of human connection. Inside the kitchen of connections catering it is not uncommon to find our staff engaged in discussions about how farming practices, food miles, seasonal produce and how best we could inspire our customers with a range of ingredients and menu plans to suit their needs. Brisbane catering taken to the streets. Corporate, High Tea, Bucks and Hens Nights, Birthdays and Weddings. Our team of staff like to walk the talk. We are all about offering people a chance to meet with us and share in a food experience. We regularly hold menu tastings in different locations of Brisbane and surrounding suburbs. All tastings are promoted in the 'what's on' section of our website - if nothing is advertised at the moment feel free to contact us for a private tasting for your event. Come along and sample some of our delicious high quality food. Connections Catering are Brisbane's ethical caterers. We believe in sustainability, wise environmental practice, community, giving back and above all things, integrity. At connections catering we use a considered approach when choosing our staff, suppliers, business and charitable partners ensuring we are always true to our values. Supporting local farmers and manufacturers is important to us. We aim to cook great tasting seasonal food, while respecting the environment we live in. Reducing food miles, supporting local economy and remaining connected to the way in which food is grown and manufactured is vital to the connections catering philosophy. We choose to use only eco-friendly and biodegradable packaging and non-toxic cleaning products produced in an ethical manner thus ensuring minimal impact on the environment. We recycle, reuse and reduce our waste whenever and wherever we can.